In 1914, Great Britain arranged with her allies on which countries they would share after the First World War. Amongst these, a portion of Albania was to be redistributed to Greece, which included Chameria. Muslim citizens of Chameria have been murdered and chased out of Greece since 1947, and this displacement expanded from the south to the north of Greece. Some of these displaced Muslims have been given place to live in Albania, but they are wanting to go back to their homes in Chameria. Requests to the UN and International Criminal Court have been unsuccessful. The genocide of Muslims in Greece has not been addressed, and neither has the losses of the displaced Muslims with regards to their homes and possessions. Ky eshte territori i Camerise, prej nga u zhvendosen shume shqiptare ne vitin 1945 prej forcave greke. This is the area of Camderia in which Greece is committing the genocide of people by brand marking them as Muslins. 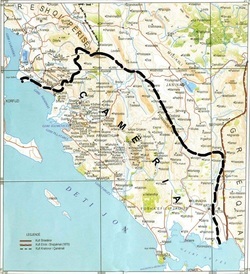 This area belonged to Albania before 1914, and was given to Greece by Britain after which the locals became persecuted by the Greek government.